Weekly Horoscope: January 28th – February 3rd – Full Moon In Leo Ahead! Weekly Horoscope: January 28th – February 3rd – Full Moon Ahead! Sunday can be restful – as long as you stay out of arguments, Aries! Chatty Mercury is antagonized by disruptive Uranus, helping sparks fly in relationships. You’ll do well to detach yourself and simply get on with what you need. Mars has entered your travel zone, with strong connections to foreign places, people and ideals now in sight. You can take flight or soar towards a philosophy you’re passionate about. This is a time of great faith, and a wonderful few weeks to put in maximum efforts around all you’ve learnt over the past few years. Saturn has recently been touring this area and it’s likely you’ve established a degree of knowledge that can now be put to good use. Fire her up, Aries! Wednesdays important full moon lights up the most creative, passionate area of your horoscope, putting your greatest talents on show. Make your power moves before the end of the week, as communicator Mercury moves from your ambitious and career focused zone into the friendly, community-focused sector on Thursday. Wednesdays full moon comes to fruition in your home zone Taurus, putting a big emphasis on family, emotions and your ancestral roots. You’re generally a steady sign but this is this lunation could have you extra sensitive, depending on what’s bought up for examination. You’ll fully engage with your ambitious career streak, which now has momentum, as Mercury joins the sun and your planetary ruler – Venus – in your ambitious and visible 10th house on Thusday. Think of your goals and garner the support of others, as you reach for the top rung on the ladder. The communication planet, and your ruler, Mercury dances into your adventurous zone of travel, education and publishing on Thursday, Gemini. Broaden your horizons by focusing on a trip abroad or stimulate yourself looking to foreign connections. You can be engaged with a project that has long distances ties or enjoy different cultures now. Perhaps you’re leaning into learning or are ready to spread your views – and all you’ve accomplished – on social media, or another publishing platform. Mars is now lighting up your relationship zone, so rope an enthusiastic partner into plans. You’ve made headway in your unions and can now breathe life into the collaborations you’ve established. Your income, job role or personal finances fill the frame this week Cancer, as a powerful full moon lights up your money zone. It’s all about how you make, save and spend your wealth! It’s worth celebrating ways you feel good about earning, too; it could be that you’re in full appreciation of being able to do what you love – and get paid for it. Think of the talents you have, and smile. Mars has entered your work-a-day zone, promising a productive week. It’s time to tackle all the projects and tasks from before the holidays – You have throughout February to accomplish all you’d like, including upping your efforts at the gym, Cancer! Conversations might get deep towards the end of the week as strong bonds are emphasized even more. Mercury joins the sun and Venus in your partnerships zone, bringing your focus to shared property, finances and investments. Think through plans for two and what you need to do to progress Moonbabe. Embrace the spotlight and warmth of the sun, Leo! This week puts the torch on you with the full moon in Leo – the moon reflects brightly in the lion’s constellation! Six months ago was the new moon in Leo and the Great American Eclipse (August 2017); at this time there was a considerable focus on you personally, and you could now see the themes of summer coming full circle, as personal plans come to fruition. Take a moment to bask in the progress made over the last few months and imagine how to carry your successes forward. With Mars now in the most passionate – and amorous – area of your horoscope you could be feeling extra romantic, meeting special people that support your cause. 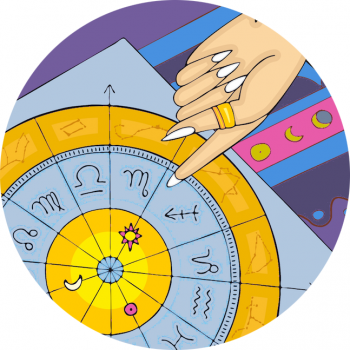 You might have learnt some major love lessons over the past couple of years, and now is a great time to show the universe you’ve taken heed and are ready to play ball. The energy planet is also activating your talents, and enthusiasm for playful creativity, so show the world what you enjoy, Lionheart! Your relationships will be easier to engage with from Thursday, as the ability to communicate and connect grows and you’re all the more dynamic in conversation. Dig deep and use your imagination to reflect, Virgo, as the stars call your memory to think over last August and all you were shedding and releasing at that time. This week calls for a pause, as the full moon highlights a cathartic shift; stop, chill and take a minute or more. Health and healing could be emphasized, as could an important love affair or soul mate connection. Perhaps you’ve successfully outgrown a bad, bad habit baby. Appreciate the transition that’s occurred since then, the progress you’ve made around closure. Leap into efficiency and productivity once you’ve had a rest, because flighty Mercury soars into the most effective and hardworking zones in your horoscope. Well laid foundations and domestic efforts you’ve made – and continue to action – around home serve you well. It’s a good time to get into your body, to nourish yourself and take steps towards self-care my Virgo Maiden. Look around you at the colleagues, community or cherished friends in your social set, Libra. Wednesday’s full moon puts its emphasis on your network, and the ties you’ve build within your wider circles since last August’s Great American Eclipse. Buy cookies for your co-workers or send out a virtual hug to your crew online. This is a particularly fun time or year and a great time to show your joyful side. Gorgeous Venus is sailing through your romantic, playful zone – the area governing kids and creativity – bringing extra smiles to your door. From Thursday it’ll be so much easier to think through projects that light up your life so begin to focus on what it is you adore! If you’re single and looking for love then activate your dating profiles asap. Local connections and your ability to learn is fired up too, so be among those your adore this week, Libra. Close ties and wider circles are thoroughly emphasized, so reach out with enthusiasm. A moment to dazzle proudly comes on Wednesday, Scorpio, as the full moon in Leo shines brightly in your career zone, the area that brings you notoriety and fame! It’s worth emphasizing the goals you’ve smashed since last August, or toot your own horn (loudly) for the recognition you deserve around your path. This week could deliver on work or job efforts, or it could be the beginning of claiming the role you heart desires. Mars is now powering though your zone of earnings and money, making it super easy to focus confidently on how you’d like to make a living. If you’ve turned a corner on your path over the past couple of years this is a milestone week for progress. It’s not over, but do take time to celebrate your growth! Elsewhere home is emphasized, with domestic goddess Venus setting up camp in your sanctuary. You might be compelled to bring about improvements in your space or to work from a quiet spot this week. The stars give you permission, Scorp! Feeling a bit perkier, Sag? You should be! Mars is now in your zodiac sign, bringing his sweet, energizing firepower to you and your personal outlook and endeavors. If you’re born in the last bit of November this week should feel extra energizing and heartening. On Thursday, chatty Mercury soars in your locally connected zone, bringing so much enthusiasm to your close ties and skills building potential. Saturday is a five-star day to speak up among peers, siblings and your most intimate community. The full moon lights up adventure on Wednesday, so celebrate a foreign alliance or a journey you’ve taken since last August! This is the area of your horoscope governing higher wisdom and knowledge, and also projects of an entrepreneurial kind. This is an awesome week to celebrate something special you’ve accomplished since the end of last summer and it’s a time to be really, really heard, so speak up! Project your special message loud and clear Sagittarius m’love. The full moon illuminates the most private area of your horoscope this week, Capricorn, putting the emphasis on usually unseen forces. This points to either an erotically charged connection that’s been in hand since last August, or could also pertain to strong bonds and commitments solidly in place. Your shared space, your joint bills or investments, your finances and passive income, or even a lump sum from a family member could be on your mind this week. It’s truly the season of money and your own role and income, Capricorn, as the stars are twinkling around your earnings and job. You can focus with confidence on what it is you’re inclined to do, and your sense of purpose, however energy is running low. It’s a good time to focus your efforts behind the scenes, in private. At the end of last year you were processing a LOT. Revisit those issues for a final hurrah, Capricorn, pushing ahead on releasing yourself from the past. This might take some doing, but by the time February’s through you’ll be ready to re-emerge. It’s Aquarius season (meaning you’re getting all the attention, Aquarius) but the full moon in Leo lights up your place in a dramatic duo! Partnerships are lit mid-week as the moon shines brightly among the stars representing relationships, so give thanks and celebrate all the key individuals that make your world a better place. Since August last year a special union might have blossomed or grown in your heart, so commit or focus on the finale. Mercury moves into your sign on Thursday bringing a sense of connection, mental aptitude and wide-awake thinking. You might have felt in la la land throughout January, a bit slow to start the year, however you’ll be back in the thick of action – especially where community is concerned. With Mars now making his way through your social sector it’s a brilliant time to be among friends and colleagues. Re-emerge, step out and network at this favorable time. This week is all about your physical self, and healing, Pisces, as the full moon lights up your fit, über productive area of wellness, while the sun shines from your recovery and recuperation zone. With health so hotly highlighted it could be a time to rest, retreat and think over how your routine and rituals have developed since August. You’re in a cycle that prompts you to step back, operating from a private, secluded spot, however the full moon is a time to celebrate the work accomplished. Strike the right balance for you. Clear the decks, making a point to let go of all that no longer serves you – including relationships; release the past, while honoring the real, day to day necessities that keep you grounded. Show gratitude for the little things, especially the chores, tasks and people that make up your everyday. You’ll be even more keenly introspective from Thursday, with plenty of action around your career path or public role keeping you occupied.